It’s hard to imagine that in a city like New York, any space would be permitted to go to waste. However, the spaces underneath bridges, expressways, and elevated trains are often more or less voids, disused and often altogether unpleasant. However, The Design Trust for Public Space is trying to change that with “el-spaces” that activate and reimagine these shadowy locales. 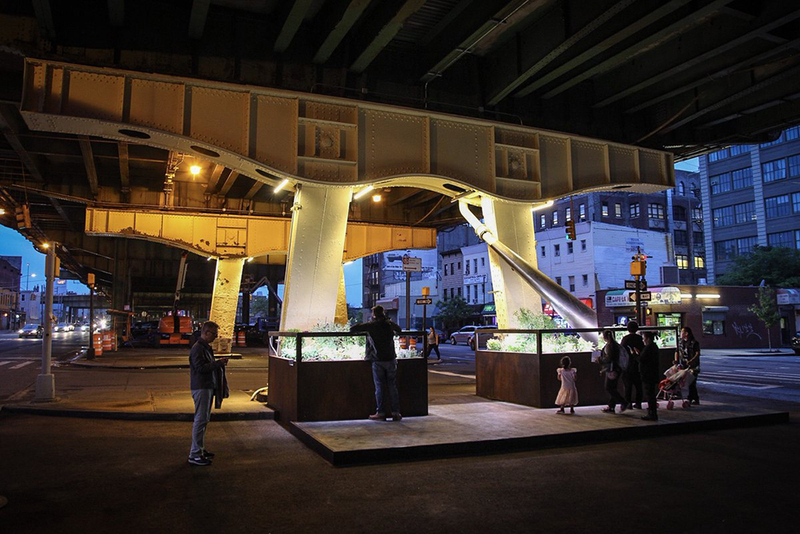 The Design Trust has partnered with the city’s Department of Transportation to create the Under the Elevated/El-Space pilot program, which just launched its first physical site test last night under the Gowanus Expressway in Sunset Park. This first el-space is a test site to show off planning methods that better connect residents to the waterfront and make the space safer for pedestrians, all while serving as a form of “green infrastructure” to improve environmental health. After a series of community charrettes and pop-up workshops, this pilot design was realized by three of the Design Trust’s fellows: Tricia Martin (landscape architecture), Quilian Riano (urban design), and Leni Schwendinger (lighting). The pilot features planters of greenery that thrive in low light on elevated platforms below large stormwater drains, and extend the public space away from cars while offering an alternative pathway for pedestrians. It also came with a fresh paint job for the adjacent support structures, brightening the area and setting it apart from the rest of the highway trusses. The pilot is also intended to offer replicable techniques that could be deployed throughout the city’s millions of square miles of underutilized space. The el-spaces are intended to increase urban livability in more than one way. Frequently, infrastructure is built in lower-income areas, bisecting neighborhoods and contributing pollution and congestion. The el-spaces help ameliorate these effects and promote greater health and connectivity in neighborhoods. The el-space pilot site launched as part of NYCxDESIGN. Its official opening was followed by a panel conversation that included participants who have worked on similar projects in other cities. Following this Brooklyn launch, The Design Trust for Public Space is planning two additional el-spaces in Queens, with hopes to spread them under the city’s 700 miles of elevated infrastructure. 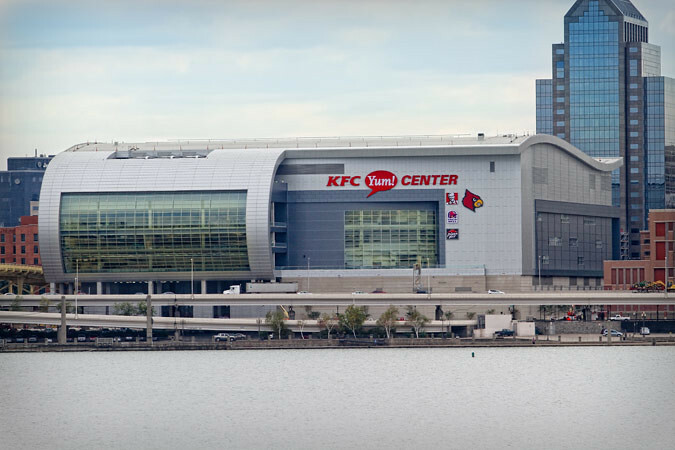 Basketball fans in Louisville gathered Downtown Sunday on 10.10.10 for a ribbon cutting ceremony at the just-finished $238 million KFC Yum! Center designed by Populous architects, formerly HOK Sports, Venue, Event. The 22,000 seat venue is the home of the University of Louisville Cardinals. Populous designed the arena to reflect Louisville's geographic situation at the Falls of the Ohio, a natural waterfall on the Ohio River around which the city was founded. An undulating roof cascades toward the river with a single fluid gesture. An adjacent street under the Second Street Clark Memorial Bridge has been converted into a pedestrian space featuring an installation by New York-based light artist Leni Schwendinger. A public ceremony will take place this evening to unveil the light display incorporated into the bridge structure. Schwendinger recently completed a light installation under a bridge at the New York Port Authority building and has been selected as part of a team to redesign Times Square. City officials have pinned redevelopment hopes on the building and have already seen development spurred by the investment. Several historic whiskey warehouses dating to the 1860s in surrounding blocks are being renovated to provide housing, retail, and entertainment space. In the above video, lighting designer Leni Schwendinger takes us on a light walk. Inspired by the Professional Lighting Designers Association's LightMapping events, Schwendinger guides us through the nighttime streets of Greenwich Village, using her keen eye to observe and interpret the urban lighting conditions. What she reveals is a nuanced way of experiencing the city—New York or any place where electric light and the built environment can be found—after the sun goes down and is not to be missed. Enjoy.